They are found all throughout most of North America. Traditionally, they prefer heavily wooded areas with access to water and food denning in hollow trees or abandoned burrows. Traveling up to 18 miles to forage for food is typical. However, they have adapted to most locales living in suburban and urban areas with ease. Suburbia offers them manmade “dens” —sheds, attics, sewers, storage areas, etc. Raccoons in densely populated areas tend to stay closer to their dens usually only a mile or so. Raccoons are nocturnal in nature so their activity periods are at night. They may sleep in their dens for several days during very cold weather in winter, but are active year round. They live in loose knit communities of 4-5 individuals for better protection against predators. Raccoons can be quite vocal using over 200 different sounds, also 12-15 different calls to communicate with one another. They may hiss, growl, snarl, chatter, whimper, scream and possibly purr. Raccoons are omnivores making them highly opportunistic eaters. Urban areas offer trash receptacles and raccoons are not selective if it’s edible. 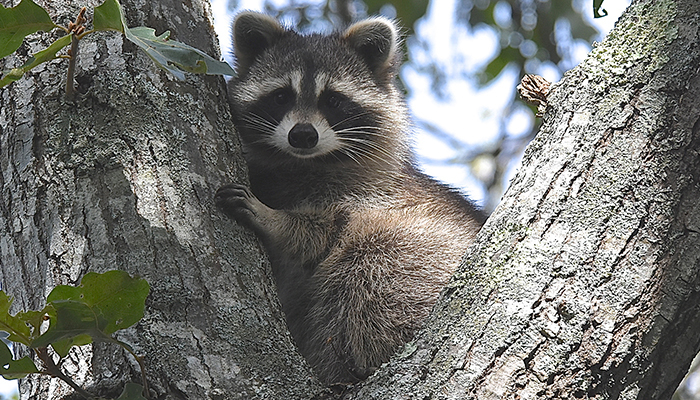 Suburban and rural raccoons dine on insects, fruit & garden items, fish & shellfish, frogs, birds, snakes, pet food and anything left vulnerable. They will raid bird nests consuming eggs and nestlings, consume injured waterfowl and muskrat kits and raid chicken coops.Their highly dexterous front paws give them access to jars, trash cans and other presumably secured areas. Mating begins in late winter and 1-6 kits are born in April or May. Mothers are very protective of their young until they separate around one year, at which time they become independent. Raccoons generally have one litter a year, unless she loses the first litter and second litter may be generated to take its place. Raccoons can carry several bacterial diseases and parasites that can be transmitted to humans and pets through a bite or the ingestion of raccoon waste. Distemper in raccoons is an illness that can also be fatal to dogs and other common pets. In the early stages, distemper produces cold symptoms in animals, including watery eyes, a runny nose, vomiting, and diarrhea. 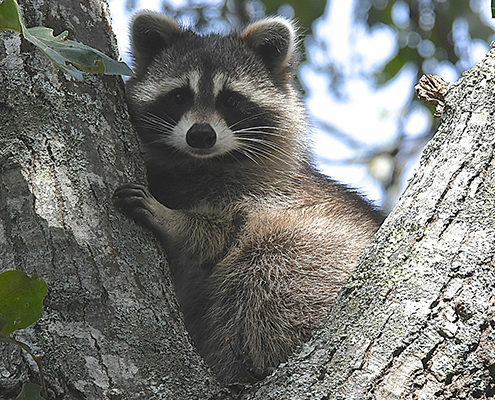 Later stages yield symptoms including a loss of brain function, which may cause infected raccoons to exhibit zombie-like behavior such as wandering aimlessly and becoming aggressive. Humans are not susceptible to distemper. RVS classified. If the animal is exhibiting aggressive behavior, drooling, foaming at the mouth--advise the caller to not approach the animal and to call local animal control officer. If their answer is no, ask if any pet has approached the animal. If the answer to both questions is no, tell them to not approach the animal. If the answer is yes, ask if anyone (including a pet) was bitten or scratched by the animal. If a mammal with these symptoms has bitten, or scratched any person or a pet, the caller should immediately call animal control to capture the animal that will then be brought to the Cape Wildlife Center for rabies testing. The caller should then alert the Barnstable County Department of Health & Environment 508-362-2511, and their own physician (for their family) and/or veterinarian (for their pet). 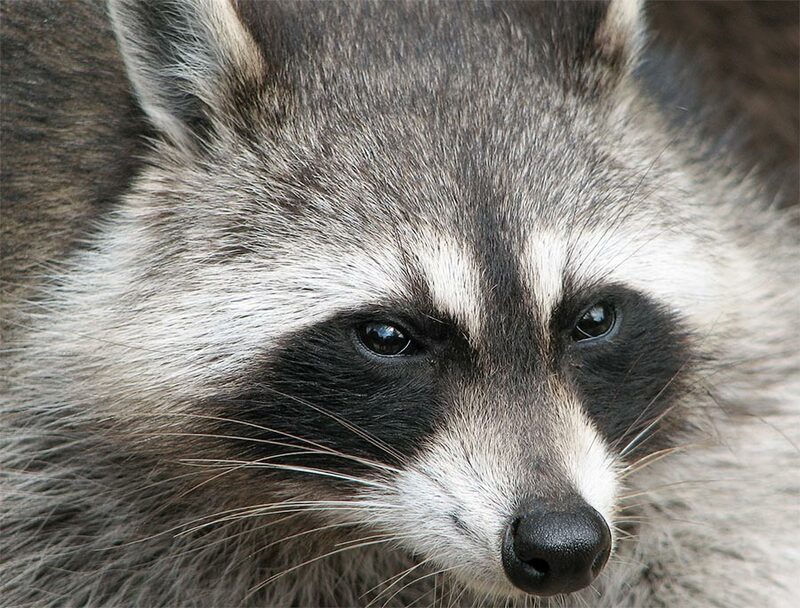 Raccoons are rabies vector species animals so they must NEVER be handled with bare hands. ALWAYS use gloves or towels or contact a professional before handling these animals. It is ok to move these animals using a tool, shovel, broom, or piece of board, to pick them up an place them in a box. They will often move into a box laying on its side, if gently nudged with the tool. Baby Raccoons are generally seen with their mother. Mothers are very protective and keep babies close. 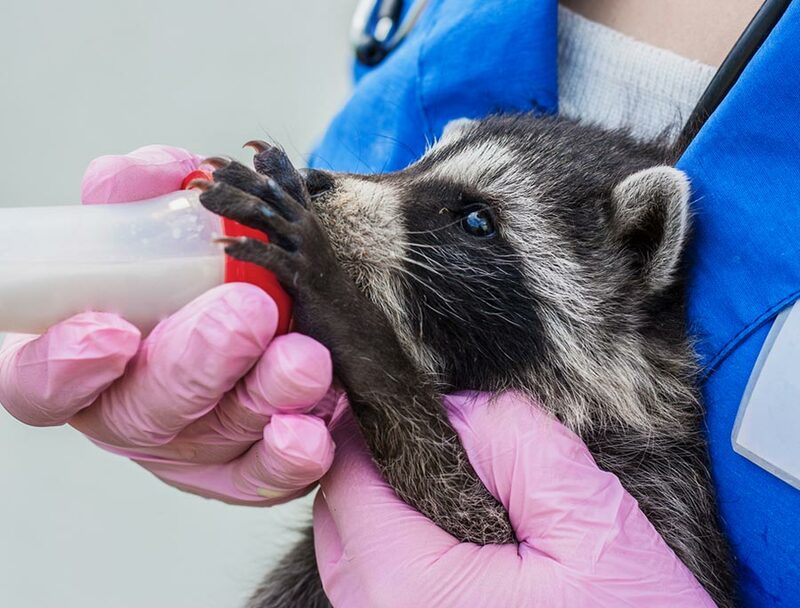 A baby raccoon observed alone is probably orphaned. 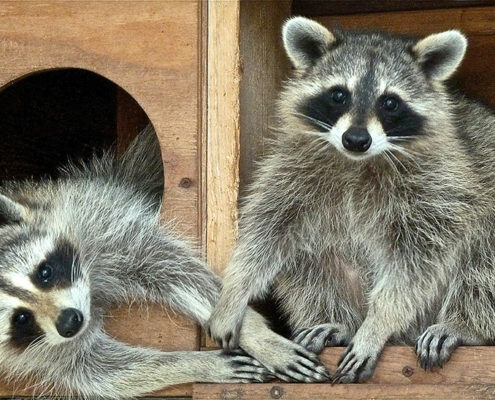 For raccoon reuniting, the box should be placed near where the mother’s nest was, or right in the path of her entry to the attic, chimney, shed, etc. where she had her nest. 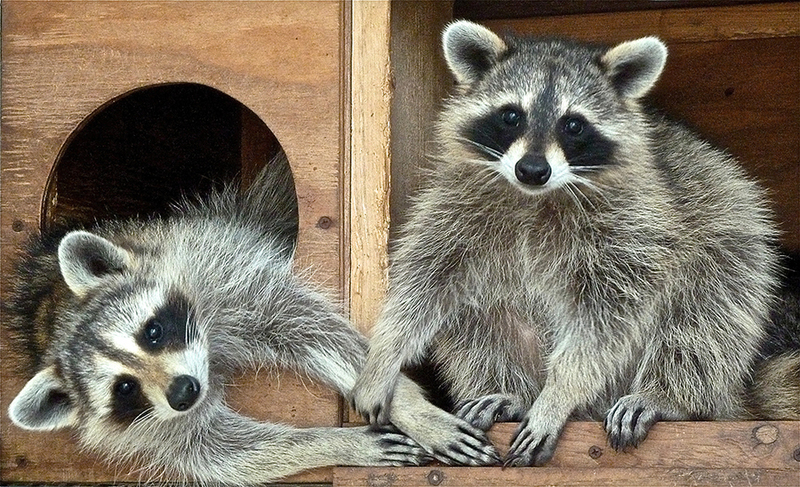 Cover the box of baby raccoons with an upside-down laundry basket and place two bricks on the laundry basket. The mother raccoon will be able to move the bricks and basket but cats and most other predators won’t. 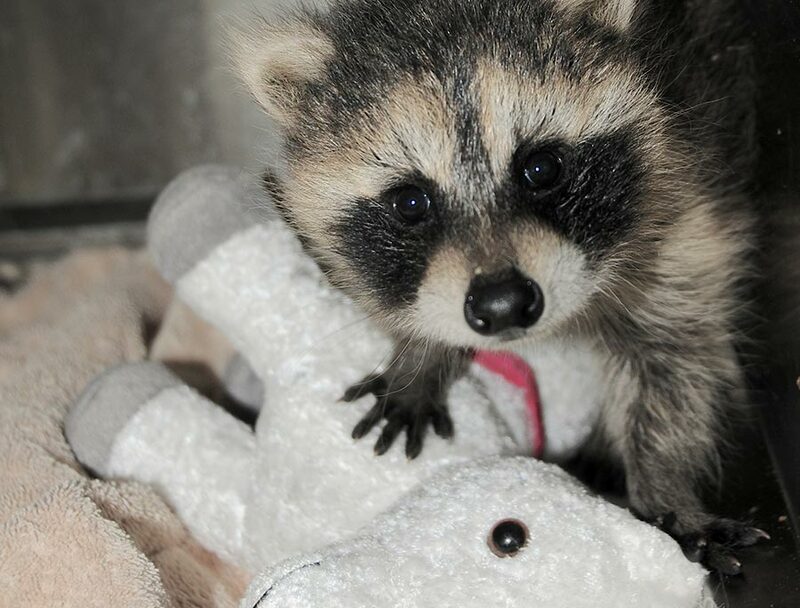 Baby raccoon reunions should be attempted overnight. If the baby's eyes are closed and the fur on the tail is very short, there should be a source of heat. place a soda bottle, filled with warm water, capped and wrapped in a T-shirt in the box, on its side, beside the babies. The rescuer may hear the babies crying – this is ok, it will alert the mother faster. The rescuer may watch from inside to see if the mother comes, but should not disturb the babies once they are in their reunion box. The raccoon babies should be checked the following morning, and if the babies are still there, we should be contacted. Sometimes the mother will not take all of the litter. Advise the rescuer to re-contact the Hotline for further information.